Just weeks after her miraculous shot in the NCAA Tournament, why talented freshman Destiny Slocum is leaving the Maryland women's basketball program. 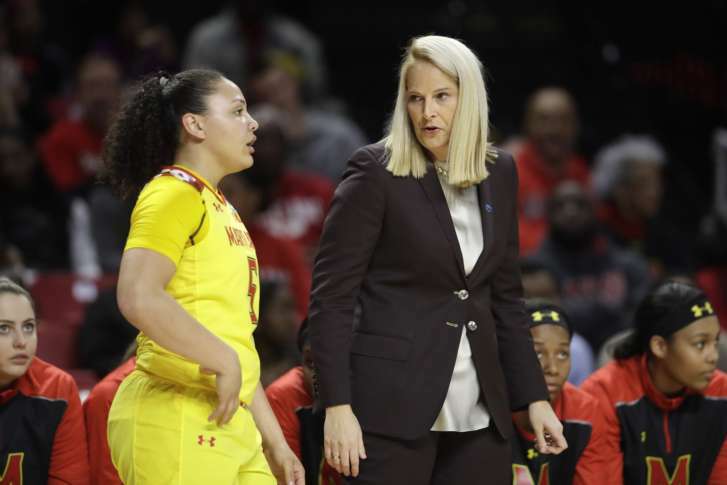 WASHINGTON — It’s hard to imagine that just two weeks ago the Maryland women’s basketball team was preparing to leave for Bridgeport and a Regional Semifinal showdown with Oregon. Members of the media covering the Terps that day knew full well that it might be the last time they’d be interviewing senior co-captains Brionna Jones and Shatori Walker-Kimbrough. But they didn’t know it would be the final time they’d be speaking with freshman phenom Destiny Slocum. The school announced Tuesday that the Big Ten, National Freshman of the Year and two others would be transferring. What happened? The Boise, Idaho, native simply missed home a lot more than she thought she would, according to multiple sources close to the program. She was also preoccupied with an illness within the family this year. A college basketball season is more than just the 30-40 games, the countless practices, or even the 30 credits worth of classes. For Slocum, it also involved being over 2,000 miles away from her family and support center. After a successful winter but long academic year, she decided to return home, though she has not announced her ultimate destination yet. Slocum was the Terrapin comet that shined from the moment she set foot on campus. The centerpiece to coach Brenda Frese’s top-ranked recruiting class, Slocum wasted no time asserting herself as the team’s offensive initiator. On a team with two prolific seniors in Jones and Walker-Kimbrough, Slocum was the floor general. She also had a propensity for hitting last-second shots — the most notable, her three-quarter court dart at the end of the first half against West Virginia in the second round of the NCAA Tournament. That would be her final game at Xfinity Center for the Terps. Two other departures will further shake up the Terps’ roster for 2017-18: sophomore forward Kiah Gillespie and freshman center Jenna Staiti are transferring as well. Gillespie started nine of her first 10 games as a freshman but saw her minutes diminish once conference play got underway. This winter saw a reserved role for Gillespie, who averaged nine minutes per game and did not play in the season-ending loss to Oregon. Staiti averaged less than six minutes per game in her lone season with the Terps. Both would have had larger roles in theory next year, with Brionna Jones graduating and no incoming freshmen recruits. But the big departure is that of Slocum, who would have been the catalyst of a team trying to find its way without Jones and Walker-Kimbrough. Because she could have continued to get better each year and see her number raised to the rafters on senior day. Because instead of the start of a great Terrapin career, this past winter will be one of unrealized possibilities. A four-year career in College Park wasn’t in her destiny. October 15 now looms large for a Maryland program that will have to replace three starters from a 32-win team.